When we first heard of Siggy’s, we weren’t sure what to expect. The name and logo came off as a bit kitschy, and the alien theme threw us off a bit. But we had heard good things, especially from New Yorkers who went to the original locations in Brooklyn Heights and the Village. And if a New Yorker says something is good, we always believe them. So we headed on over to Belmont, an up and coming neighborhood in Charlotte in between NoDa and Plaza Midwood, to see if the alien hype was to be believed. 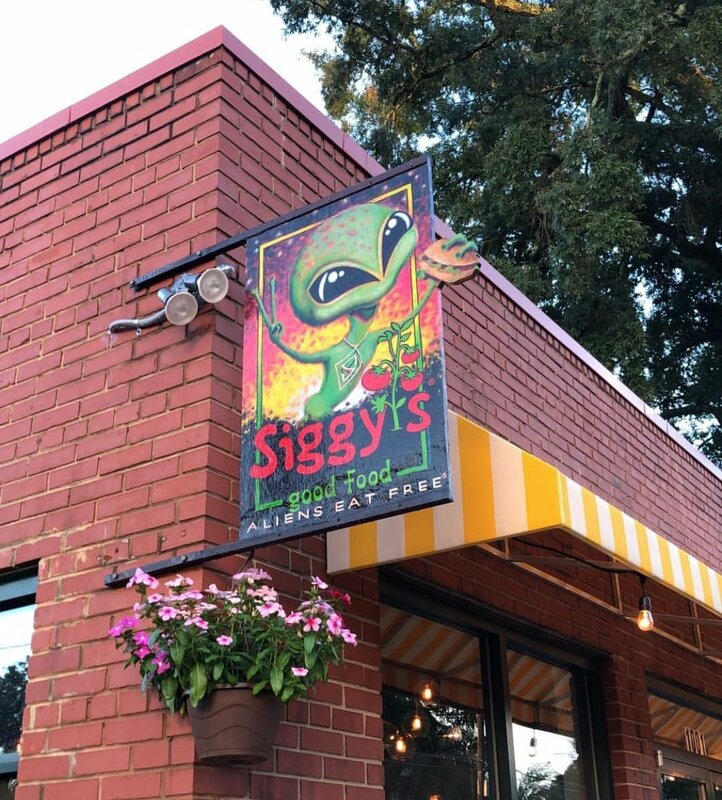 Whether you believe in aliens or not, Siggy’s Good Food does indeed have good food, and it’s worth a visit. Siggy’s is owned by Siggy Solitto, a feisty Israeli who isn’t afraid to tell you how it is, like that Charlotte needs some good bakeries, or that the NYC restaurant scene is becoming too expensive for small restaurants like hers to survive. Her restaurant is 100% organic, and she doesn’t accept crappy produce. Quality shines through in her simple and thoughtfully prepared menu. You think you’ve had a good beet and goat cheese salad? Wait until you’ve tried Siggy’s. The flavors and textures of her dishes are outstanding, craveable, and left us wanting more days later. Siggy opened up her first restaurant in Brooklyn in 2005, her second in lower Manhattan in 2012, and she decided to move south in 2018 for a better lifestyle. In Belmont, she is recreating the neighborhood feel of her first location in Brooklyn. Her menu has changed somewhat from its NYC iteration, most notably missing is her famous Happy Burger, which she says she might reprise once the restaurant settles in. The current menu is broken up into three main sections: Salads, Sandwiches, and Bountiful Earth Sides. We haven’t tried everything on the yet, but what we’ve tried has been great. Siggy serves baby artichokes with the stems intact. These were tender and simply flavored with oil oil and salt. The beets were perfectly al-dente. 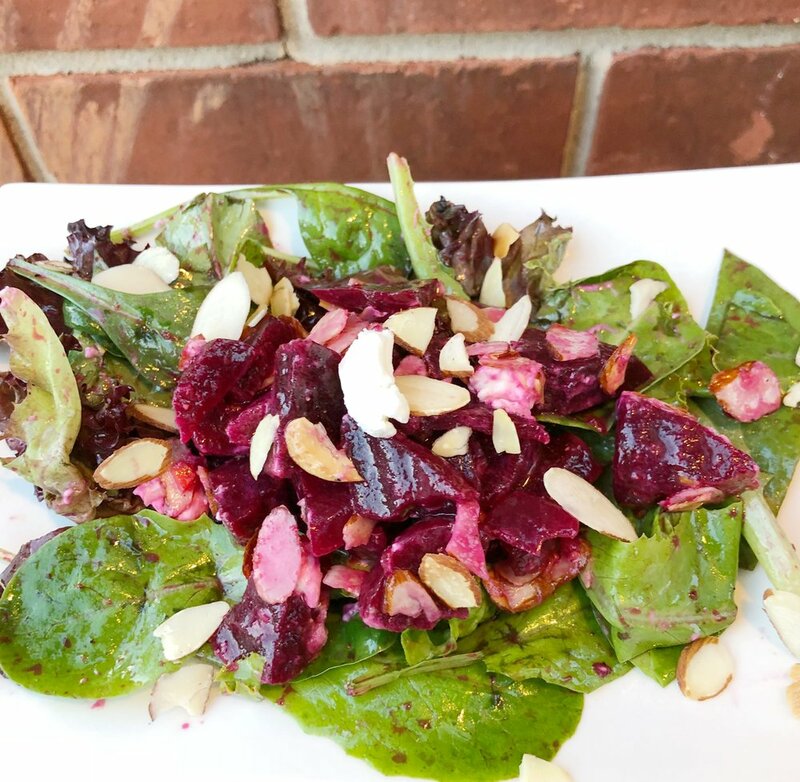 The combination of the crunchy almonds, creamy goat cheese, and earthy beets made for a healthy and delicious combination. in olive oil, lemon & paprika, clover sprouts, tomatoes, baby greens, and vegan mayo. This is not your average tuna sandwich. We’ve all had crappy canned tuna, and I wouldn’t wish that upon my worst enemy. 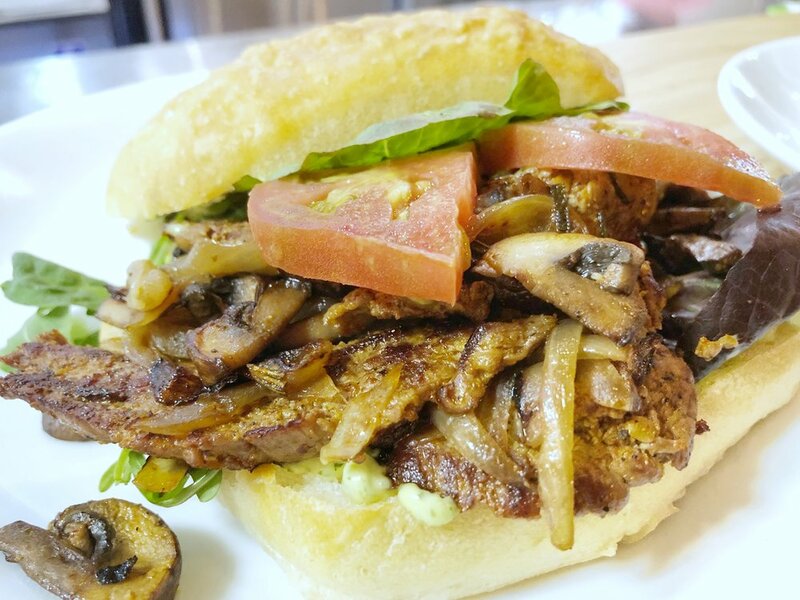 Try and find a better $12 steak sandwich, I dare you. The magic here? It’s the marinade, which makes the steak so juicy. 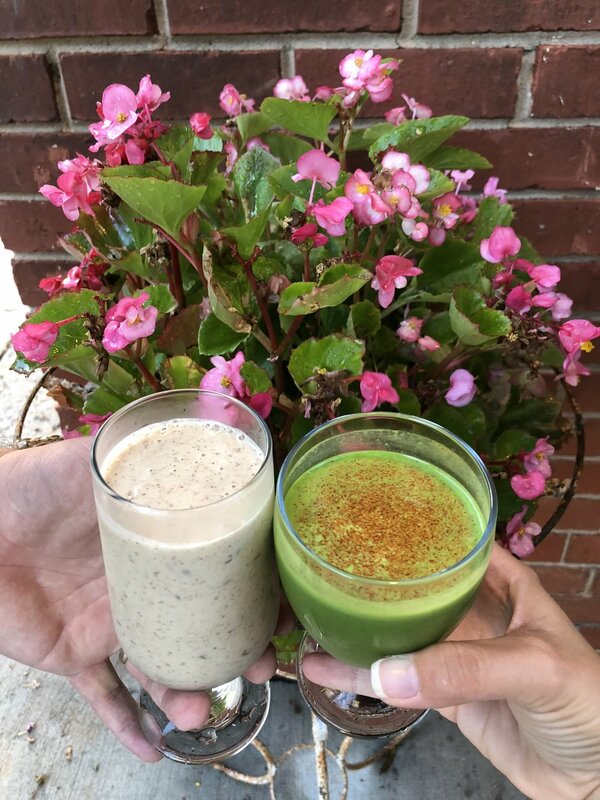 Siggy’s is known for their organic smoothies and juices, which range from Jason (all fruit) to Yvonne (all vegetables). All are made right in front of you with all natural, organic ingredients. I tried the Raw Almond Smoothie, which had raw almond butter, dates, banana, and almond milk. It was delicious, and a meal in itself. Yvonne tried a Flu Shot juice, which contained greens, lemon, ginger, cayenne pepper, and echinacea. Yvonne had one sip of my Raw Almond Smoothie and claims she has been thinking about it since. Siggy’s designed the restaurant herself, and the vibe is very relaxed and inviting. There are floor to ceiling windows and a very large patio. You order at the counter, and you can sit and relax or take your order to go. Siggy told us she’s happy when people hang out, and she’d love it if people would treat Siggy’s as the neighborhood hangout. Of course, keep an eye out for all the aliens—they’re everywhere. Siggy, her niece, and the rest of the alien crew are fantastic. They treat you like family from the moment you walk in and remember you the next time you show up. What more do you want from a neighborhood spot? Belmont is up and coming, but definitely not quite there yet; Make sure you stop and look both ways at the stop sign in front, because it’s not a four-way stop sign, and we almost killed ourselves twice; We are 100% Ancient Astronaut Theorists, I mean, how were the pyramids built? ; We didn’t even talk about the parsley hummus, but that stuff is good, too; Never mess with an Israeli, because they can kill you in less than seconds. Disclaimer: This meal was provided free of charge in exchange for an honest and unbiased review. All opinions are our own, and we were not compensated for this review.